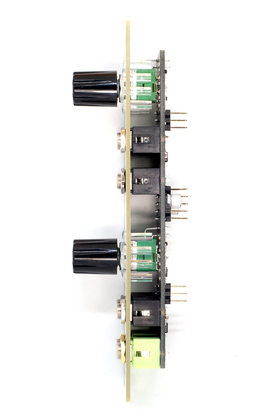 The Listen IO is a simple module which gets signals in and out of a Eurorack system by converting to and from normal modular levels. 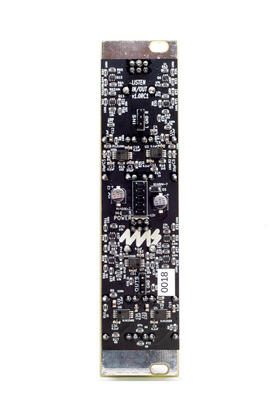 The top section converts any external signal to modular levels by providing up to 30x gain (+30dB), allowing you to use table-top synthesizers, keyboards, phones/tablets, computers, toys, microphones, etc. in your patches. The bottom section does the opposite: modular signals are converted to normal line level signals. The bottom two jacks can be used as line outs or as headphone jacks, so you and a friend can listen in stereo at the same time. Test conditions: Test signal input into left Mod In jack. Sine wave at frequencies from 20Hz to 20kHz tested. Result given as a ratio of the appearance of test frequency measured on right Line Out jack to left Line Out jack. Test repeated with left and right jacks swapped. Worst-case results for any channel and frequency reported.